Children, come along and join us for our morning well-being sessions. It really sets you up for the day. *On the KS2 playground unless wet weather, then moves to the hall. PSHEE (Personal, Social, Health and Economic Education) encompasses all areas designed to promote childrens personal, social, health and economic development. It gives children the knowledge, skills and understanding that they need to stay healthy and safe, develop worthwhile relationships, respect differences, develop independence and responsibility, and make the most of their own abilities and those of others. We use the Wiltshire Learn4Life scheme which provides the children with a wide range of activities and resources to support their learning. Learn4Life was written by Wiltshire teachers for Wiltshire teachers. It is a complete scheme of work for years 1 to 6, which is designed to integrate the SEAL emotional literacy materials with the wider aspects of the PSHEE Education curriculum. SEAL helps children to develop self-awareness, motivation, social skills and managing their feelings. These skills will help our children to become better learners, get on better with other people and be responsible citizens. They are part of every area of life. Our ethos and PSHEE curriculum ensure that we meet the 5 strands of Every Child Matters which states that every child has the right to: Be Healthy, Stay Safe, Enjoy ad Achieve, Make a Positive Contribution, and Achieve Economic Well-being. Aims of PSHEE Education at Corsham Regis Primary Academy. Our school mission statement reflects what we hope to achieve in PSHEE. to know about economic wellbeing. make informed choices about dealing with risks and meeting challenges now and in the future. decide on values by which they want to live their lives. Our school curriculum and ethos promotes spiritual, moral, social and cultural development and prepares all pupils for the opportunities and responsibilities within their lives. We use Mindfulness to support our children's learning and well being. Madame Price and I have completed a Mindfulness Based Living Course and applying what we have learnt to the school setting. Twice a week children gather before register to practise Mindful Movements and some staff are using it to transition between learning and playtimes or as a focusing exercise in the classroom. Circle Times are part of every Learn4Life lesson and are used to improve our understanding.of each others emotions.
" You get to say what you think about your life and people listen." I like Circle Time because you don't have to stick with one person's ideas, you all get to share what you are feeling and you get to say your point of view." I like it because you get to know what other people are thinking not just your own ideas. So if they are sad you get to know and can cheer them up." Over the year we have been looking at some Mindfulness techniques to help us relax and to prepare us for learning. During the Spring Term teachers spent time with their classes learning the first 3 mindful movements from Thich Nant Hanh (leading Mindfulness teacher). 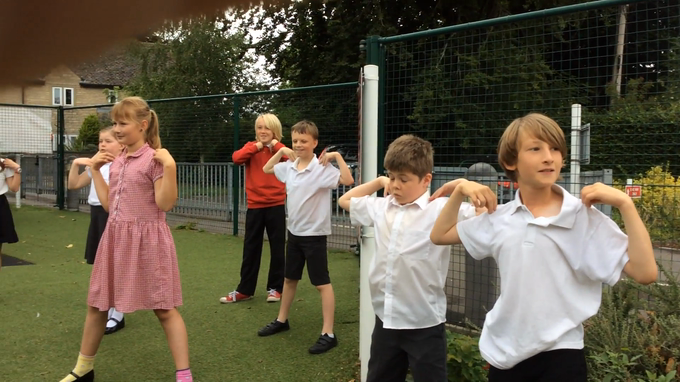 Now we are meeting twice a week in the hall for any children or staff who want to do the movements together. It is a fantastic way to start the day. Learn 4 Life Curriculum from Wiltshire Schools. WE raised £242.16 for Wear it Pink! And had lots of fun!